DKIM is normally configured via GreenArrow Engine’s web interface. However, command line configuration is also possible. This page documents both options. 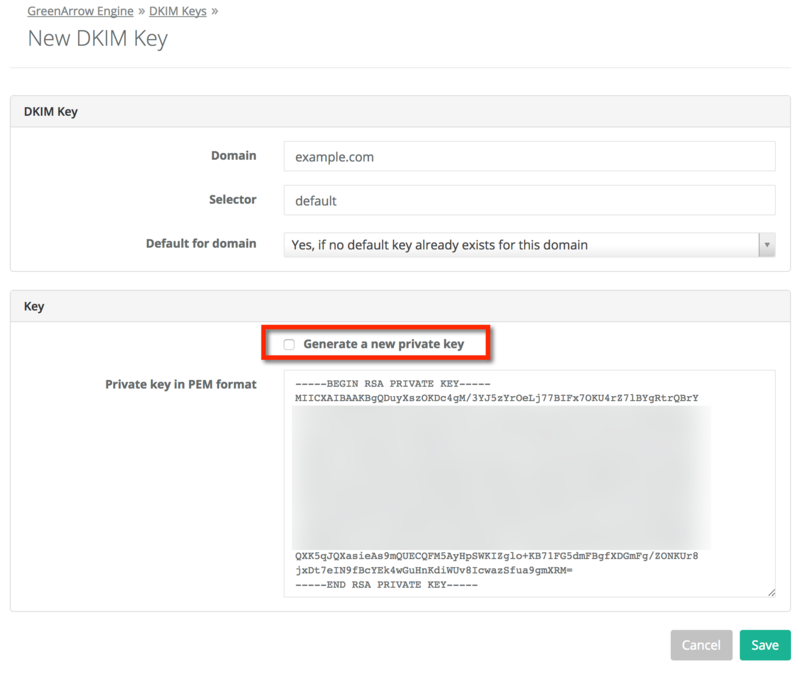 The first step in configuring DKIM is to create the private key that’s used to digitally sign messages. Be sure to complete the final setup steps. You can configure DKIM keys on the command line by editing the /var/hvmail/control/dkim.json file. If there are any conflicts between the contents of this file and the web-based configuration, then the web-based configuration takes precedence. For example, if the same domain/selector combination is configured in both locations, then the key that’s configured in the web interface is used for signing. 1 to make this the default DKIM key for the domain. 0 to not. The PEM encoded private key. Since this is being stored in a JSON document, line ending should be encoded. For example, the configuration below encodes line endings as line feeds (\n). "key_private": "-----BEGIN RSA PRIVATE KEY-----\nMIICWwIBAAKBgQDRzSh5YUKsZrfG6h0KObZikPXMbUqMtoBvY8RTF24frqxFKNeF\nHSCaD2oTu3eFqyi4lxndYmAFqUmWl5EhqS/EHqCCKso/gRLCL6pqHvUPGBiZqT8f\nqOF9Ccl7FK5asQ6bK6zYpwQQUVBPOvMW52AUlKCVQP1VAtQ7t29PoC+w2wIDAQAB\nAoGAL7sbIDJOduaPnQOaQ79JjTcplK6wrT7ADZeHDNhhx3d33ewizDgKOMKVAZQ+\n5vw/sW8/BSziZ6dSBJ7K9/uD0BLYGh7EzzlfmWtUblwHRhK23zsVcPmYsSyrd4pf\nDvd5csyvorIreqDfua5mv3zFIQqA2ZDarNq6sjsez2qeZnECQQD6x3yJRyGUWqaN\na4HK3GeaO6N2J1L99MUi9Ozy6l4BZ17gf+WxlMJo6rUsVza7INhN2HxSXHPYoady\nEx1TbJvNAkEA1itIVlyWlxAJlvNdwuGkDtPlphV/a61iIgU14escaBU4Rg0yHLdM\n3x6Cf4Jl1HcKSODSD45FyhbimikXHOVnRwJAYxWKqRrHs7wVbm75u1NWQ+Qoc7iZ\n2+loMqWfMWNUfS2AmScvc/iYz6dcqgZTg6A4lplglZId24wTgsj2n02cSQJAQqVR\na16Alh2tfkXZRY3F6b9S1W4XKsDXqtKIQ/dP7au8yT/N+lWoHD54SYmgeo9Yqfkc\nJS8W1J5ugZ6LzLgufQJAW5WlGtyo8RfEbbnGRfeGHRFIf8vHt0a3BThEsh51QRJ3\neT3U4ajMxJfeXFdhzfLDzxtpSM78qfj70DtFWUDcUQ==\n-----END RSA PRIVATE KEY-----"
Changes to the configuration file are automatically applied within 20 seconds. 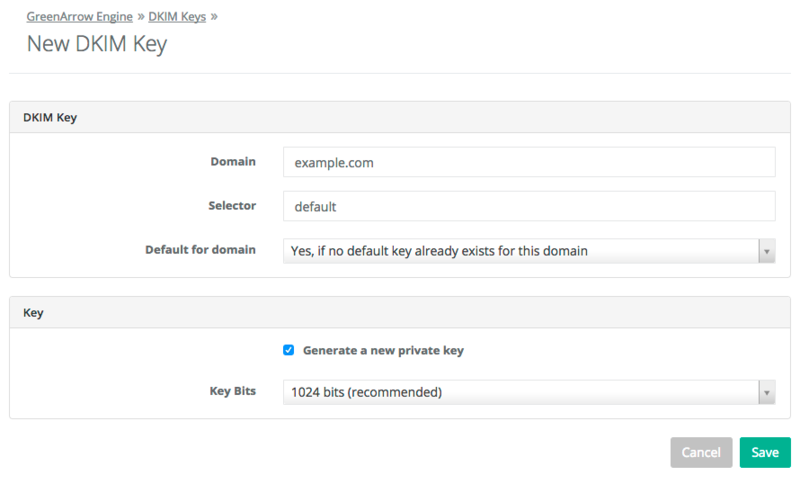 After a new DKIM key is created, the next step is to create the DNS records for it and testing to make sure it passes. Yahoo’s Feedback Loop is DKIM based, so you’ll probably want to register any newly created DKIM keys with Yahoo.